The ER doctor was certain that Peter was near the end of life, in part due to post-surgery rehab not progressing well. The physician reinserted a temporary feeding tube, overruled the “nothing by mouth” rule and handed Peter a cup of water and some gelatin. The simple act of kindness made Peter the happiest man alive. Linda was conflicted. She was afraid of doing something wrong, yet loved seeing the twinkle in her father’s eyes. The physician explained that palliative care respects the wishes of patients who are expected to die. He even offered to remove the temporary feeding tube, but Linda felt it best to discuss this with her mother before making that decision. Peter left the ER overjoyed, and Linda received a referral to a palliative care agency. Follow the doctor’s orders; do what others tell you to do. Keep your patient alive as long as possible. Many patients die from complications arising from dementia, but who decides if this condition is terminal? Aren’t caregivers in the best position to determine if the patient can live with this challenging illness? Inevitably, aging and chronic illness make people no longer enjoy living, leaving caregivers at their wit’s end. Like Peter, many patients become frustrated by restrictions that prevent them from activities such as driving or even eating. Caregivers like Linda are torn between what others expect and what their loved ones want. These situations usually come to a head in the ER and are resolved through knowing what your patient wishes for. Patients are like employees who listen to the boss, obey the rules, and avoid termination. The best way to negotiate the impasse of potential termination is for the patient to resign before becoming fired. For patients, telling physicians that their services are no longer required puts them in control. Most patients wait to hear physicians tell them that there’s nothing more to do. Your goal as caregiver is to support your patient’s desire to retire well before hearing, “You’re fired!” If Linda had viewed dementia as a terminal illness, Peter may have never agreed to have a feeding tube placed. Chronically-ill patients generally reach a level of debilitation where they no longer wish to live. To them, survival isn’t a viable option if they can’t live semi-independently. As the times change, so do the rules. The general rule is that healthcare providers and caregivers do everything to keep patients alive. Patients with a chronic or terminal illness diagnosis become the exception to the rule. When there is no expectation of recovery or survival, patients might bargain to experience natural death. By simply allowing nature to take its course and leaving well enough alone, patients might become less obliged to doctors’ orders and what the healthcare system encourages. In Peter’s case, leaning toward natural death might have allowed him to refuse the hip replacement and the swallow study. You might think of the end of life as being a free fall for your patient either with or without benefit of a parachute. You cannot stop the forces of gravity, but you can ensure how your patient lands. Patients who receive palliative care have a parachute. Pulling the ripcord of the parachute means your patient has enacted his or her intention to experience natural death with a peaceful landing. Becoming the exception to the rule means your patient can “pull strings” to get what he or she wants. One goal in life is to reach the point where there are no expectations or rules. This is often difficult to imagine, yet infants receive care with few impositions or expectations placed on them (except immunizations). As caregiver, you need to provide your patient this type of permission slip, excusing them from unnecessary medical intervention. Having no rules gives your patient a new lease on life, lessening the burden of caregiving. Your patient will often experience a new found freedom resulting from having things his or her own way. Patients who receive a little piece of heaven on earth creates happy endings with less grieving for caregivers. Cutting the strings that bind you and your patients sets them free. Peter deserves nonnegotiable freedom at the age of 91. If not now, when? The goal of advance care planning for caregivers is to have them evolve in their thinking about the do’s and don’ts. Nonnegotiable freedom implies that there can be nothing that holds your patient back from living fully. Love has no bounds when there are no rules. 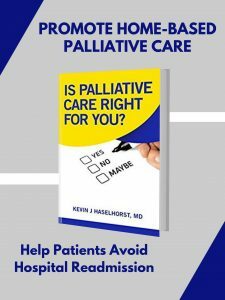 Enrolling your patient in palliative care is in effect offering him or her a bargaining chip. This works well in negotiations between the patient and the physician. Your patient’s desire to live and let die needs the recognition and support of those involved in his or her care. 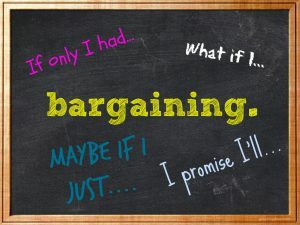 Bargaining on behalf of your patient’s best interest yields immeasurable dividends for all.